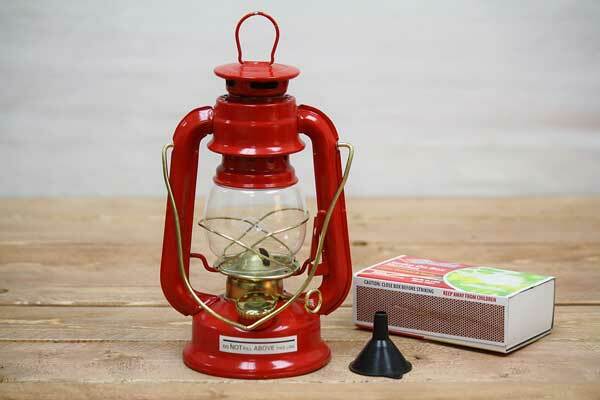 Small hurricane lanterns available in classic red and green. Old fashioned style. This little lantern complements rustic decor and is a great ambient light inside or outside. With a brightness of 6 candle power these small oil lanterns are great for reading a book or lighting personal space. If you're trying to cook dinner with a group you will need more light from a bigger lantern. These mini oil lanterns feature a globe raising side lever for easy lighting and wick trimming. Suitable for use inside or outside. Carry outside or hang along a wooded path with the top metal bail handle. They're so darn cute it's hard to resist rustic lantern centerpieces for the next summer night party. Made by V&O Lanterns.